Total: 45 Min. | Active: 45 Min. Fast, creative cookies with zero baking time. 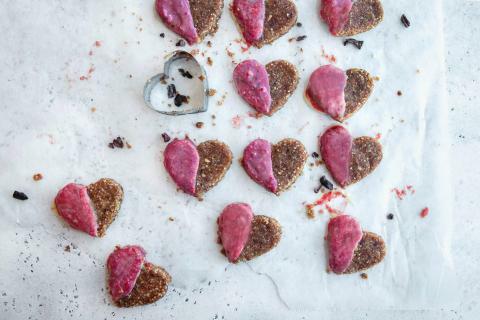 These healthy cookies are gluten-free, vegan and free of refined sugar. The original recipe with guaranteed success is for 20 pieces. Altering the number of portions may result in alternate results. Please note that the existing quantities are not automatically adjusted in the text. Puree all the ingredients in a mixer. Shape the dough into a ball, roll out to a thickness of approx. 5 mm. Cut out approx. 20 hearts, place on a tray. Place in the freezer until ready to ice. Melt the cocoa butter with the rice syrup, mix in red food colouring. Decorate the cookies with the icing, leave to dry. Double the recipe and enjoy these cookies the week after, too.